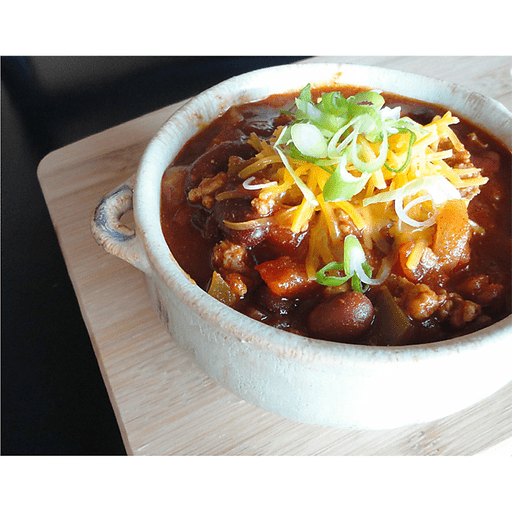 Our ground turkey/beef blend shines in this Hearty Meat & Bean Chili. 1. Heat a large Dutch oven or soup pot over medium-high heat. Begin browning the ground turkey/beef blend in the pot, and add onion, green pepper and garlic. Season lightly with salt and pepper and cook until the meat is thoroughly browned and the vegetables are tender. Drain off any excess grease from the pot. 1. Stir in remaining ingredients and bring to a boil. Cover, reduce heat to low, and simmer for 20 minutes. Garnish with desired toppings. Calories 320, Total Fat 7g (Saturated 3g, Trans 0g), Cholesterol 50mg, Sodium 930mg, Total Carbohydrate 37g (Dietary Fiber 10g, Sugars 8g), Protein 25g, Vitamin A 25%, Vitamin C 50%, Calcium 10%, Iron 20% *Nutritional values are an approximation. Actual nutritional values may vary due to preparation techniques, variations related to suppliers, regional and seasonal differences, or rounding.